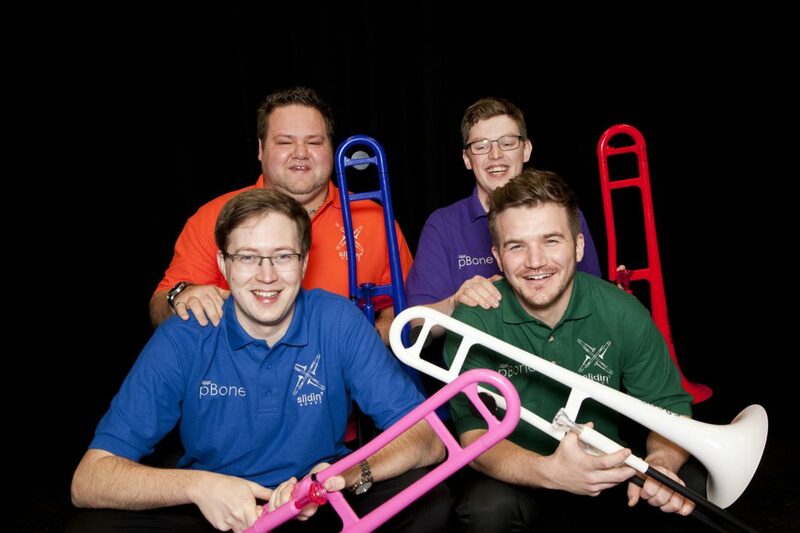 Slidin’ About Trombone Quartet take pride in performing at the highest level and are passionate about inspiring the next generation. 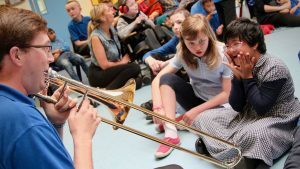 All four members are specialist brass teachers and are experienced at working across a wide variety of educational settings including Special Educational Needs (SEN) and Pupil Referral Units (PRU). Together they provide music workshops and participatory concerts which are enjoyable, interactive and educational. The group’s unique relationship with Warwick Music as pBone ambassadors enables them to supply a set of 35 pBones for a truly hands on experience. These educational sessions can be tailored to all needs and time frames. Each member has a DBS certificate and workshops can be photographed as well as recorded in audio and video. This concert is a great option for any group size and works especially well for a whole school. Lasting between thirty minutes to an hour, the session will take the audience on a musical experience with pieces involving singing, dancing and clapping. 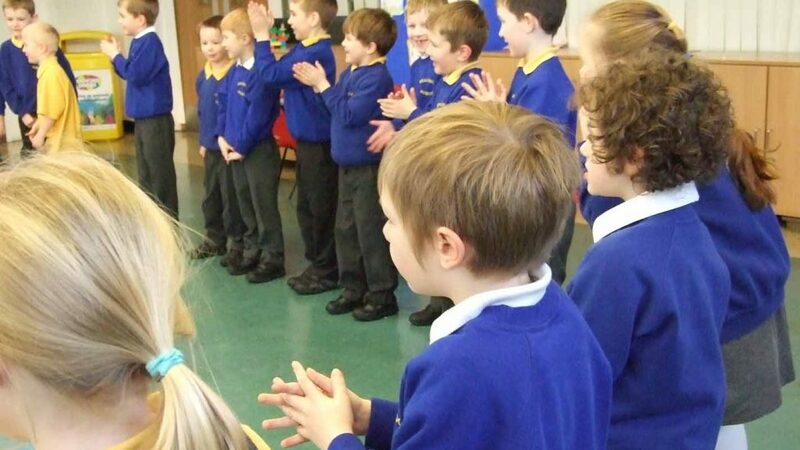 This concert is suitable for all ages and specialist school settings. For 45 minutes the quartet can take your whole school or group on a journey through the history of music, stopping along the way to listen to some of history’s famous composers. Not only will they get to hear and experience the highest quality live playing but they will also be involved in our exploration of how music has changed. 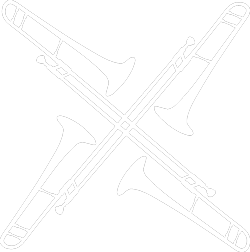 Over a single day the quartet will provide tuition for a group (up to 35) on our set of pBones. 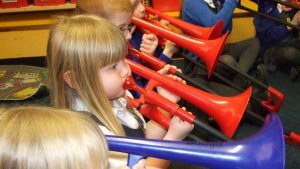 Usually aimed at year 5 or 6, the day is highly interactive and focuses on composing and playing as a group. This is a great way to bring your class together to get them all working to one fantastic goal. This extension of Play in a Day provides the participants with the opportunity to further their musicianship and playing ability. 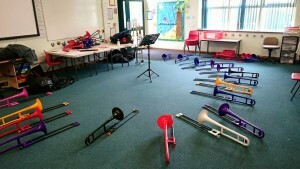 The extra time allows the children to learn and refine new skills and perform in a concert. The quartet can also incorporate any other musical instruments that the children may play. 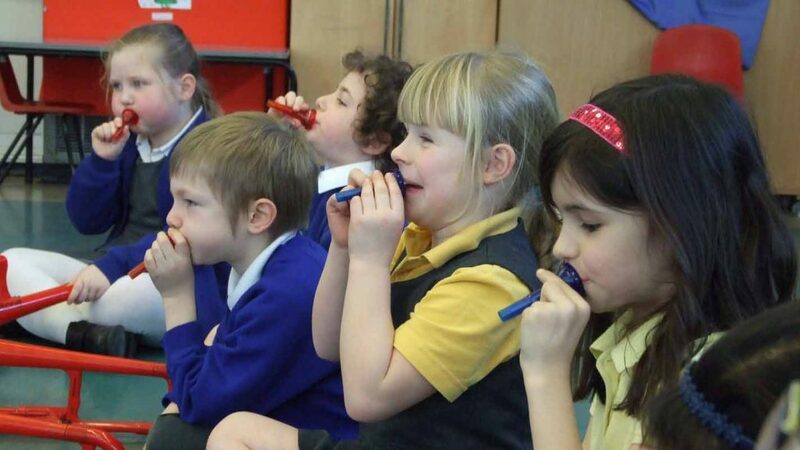 This is a fantastic way of giving everyone an experience of learning a musical instrument. The members of the quartet guide each class on a whirlwind tour of the trombone over thirty minutes. The best participants have the chance to perform with the group at the end of the day. Nobody is too young to experience music. 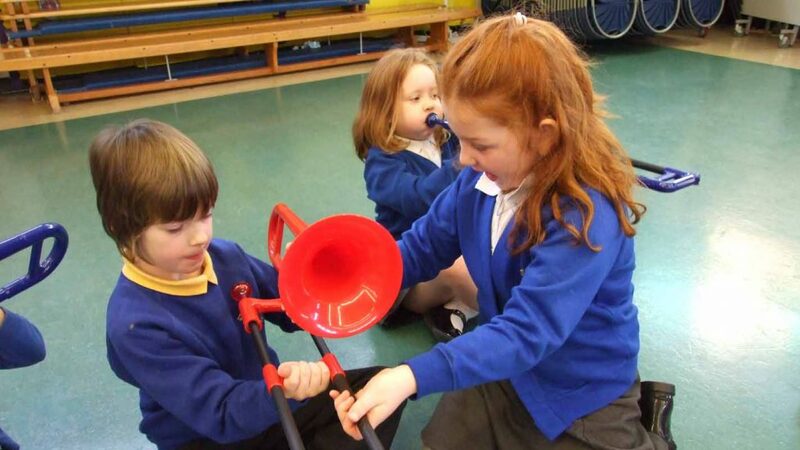 Using their selection of pBuzz’s and percussion instruments, the children embark on a musical sensory experience into a world of new sounds. Sessions can be any length but it is essential that carers and helpers are there to support the children in this exploratory session.